Does your wardrobe look weary? Maybe your desk is looking dodgy or your drawers have seen better days. Don’t worry! If you fancy giving your bedroom furniture a facelift, have a look at our range of sticky-back plastic from d-c-fix. 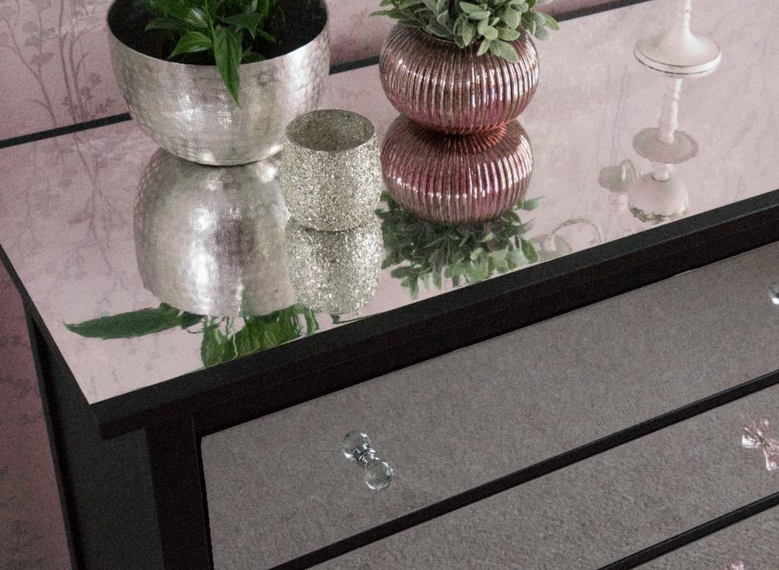 It comes in loads of colours and finishes, from classic wood effect right through to shiny copper foil, so you’ll be able to re-create whatever look you’re loving at the moment. Best of all, it’s quick, mess-free and simple to apply. With all this coming at a fraction of the the cost of new furniture, what are you waiting for? 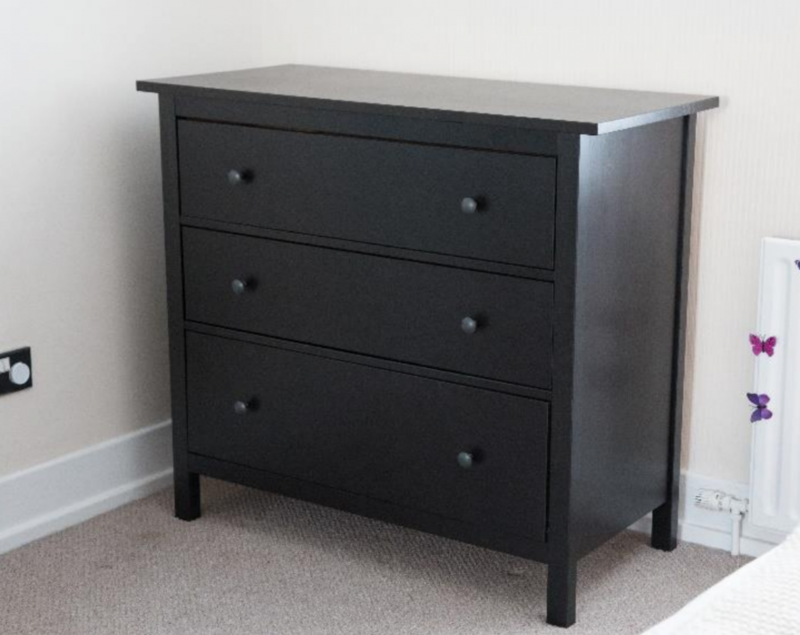 Step one: Remove doors and drawers, and unscrew handles. Step two: Clean thoroughly to eliminate dust and grease. Step three: Measure the door or drawer front and cut the film, leaving enough excess at each edge to fold around. There’s a handy grid on the backing paper which makes measuring and cutting in straight lines easier. Step four: Peel away a small section of the backing paper and secure a section of the sticky back plastic to the surface you want to cover. From there, gradually peel away the rest of the backing paper little by little, smoothing the film in place as you go. If you make a mistake, don’t panic – simply peel back and start again. The adhesive gains strength over time so can be easily adjusted during application. Should any air bubbles appear, use your smoother to push them out to the sides. A pinprick will help eliminate bubbles too. If the surface isn’t flat (e.g. shaker style doors), use a hairdryer on a low setting to warm the film so it moulds into the shapes, then push your smoother into the nooks and crannies. Step five: To create nice neat corners, cut a diagonal line into the corner with scissors. Take one side and fold around the corner. Then take the other side, fold it around the corner, stick it down and you’ll be left with a small triangular piece of excess material, which can be trimmed away with your scalpel. Repeat for all four corners. Step six: Reattach handles, replace drawers, re-hang door, then stand back and admire your handiwork! 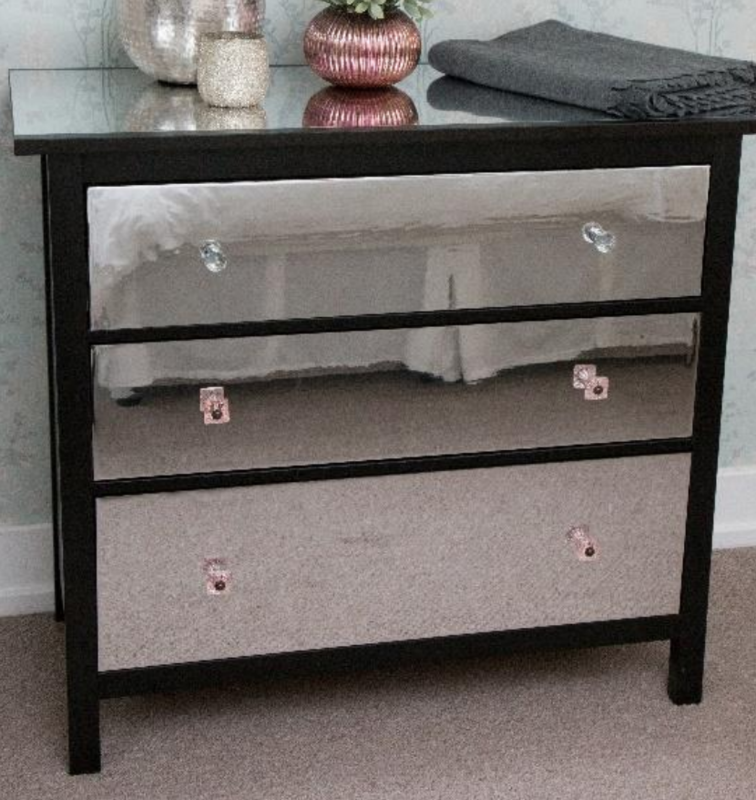 Mirrored furniture is a huge trend in interiors at the moment, but prices can run pretty high. 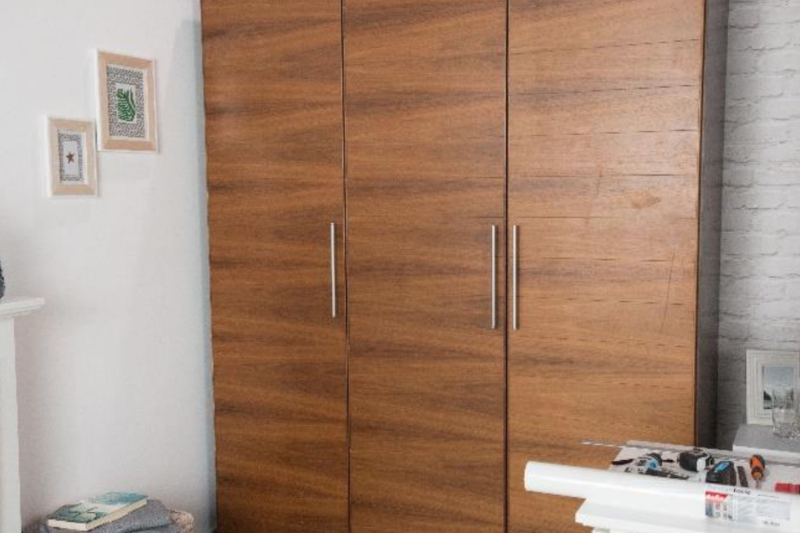 If you haven’t got the spare cash to drop on some new drawers, we’ll show you how to have a go at upcyling your current furniture. You’ll need the equipment listed above, plus a roll of d-c-fix mirror effect film and a cutting mat. Step one: Remove the drawers from the unit and take off the handles. Clean thoroughly to get rid of any dust or dirt. Step two: Measure the drawer fronts. Cut the film a couple of mm larger than the drawer all the way round. The handy grid on the backing paper will help you measure and cut in straight lines. Step three: Peel away a small section of the red printed backing paper to reveal the sticky side of the film, (making sure you leave the black printed protective layer of film in place for now). Stick the film to the drawer front and gradually peel back the rest of the red printed backing paper, smoothing down as you go using your smoother. The film is very thick so it’s unlikely you’ll get air bubbles but if you do, simply peel back and re-apply. Step four: Trim the excess film from the edges using your scalpel blade. This is easier than trying to cut the film to the exact size of the drawer and then having to line up all the edges exactly. Step five: When all the drawer fronts have been covered, put the drawers back into the unit. You can now remove the top protective layer of film to reveal the mirror effect. If you have enough material you can also apply the film to the top of the unit to create even more of an impact. Step six: Re-attach the handles and enjoy the transformation – ta-daa! With such a wide range of colours and designs, it’s easy to get creative with sticky back plastic. The only question is – what will you fancy up first? 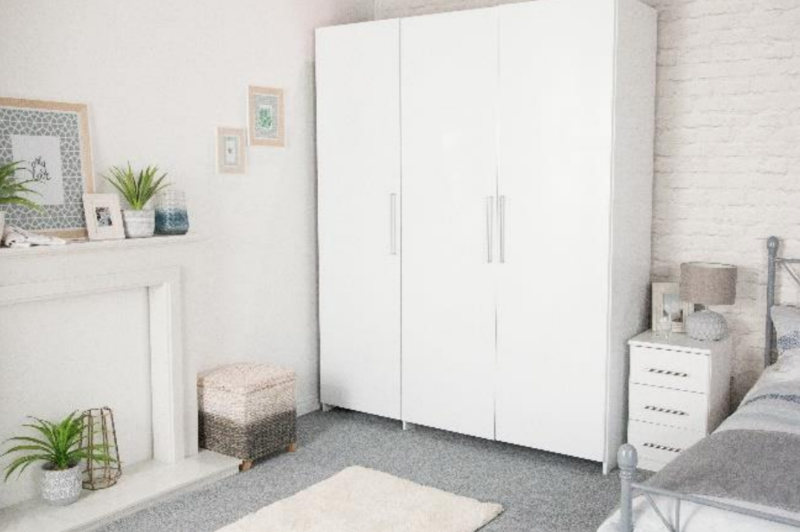 Shop the full d-c-fix range online – and don’t forget to share your upcycled bedroom projects with us on Twitter, Facebook and Instagram!